0.75" wide strap with a shoulder drop of 10"
Ever need a good tote for the beach or a day at the lake? Now you can get one personalized. These tote bags are the perfect thing for carrying everything you could need for a fun day outside. This tote bag is made right here in the USA and is made out of a sleek fabric with a slight sheen. It comes in two different sizes: Regular (15"W x 13"H x 6"D) and Large (19"W x 15"H x 8"D). Attached are two strong straps that are about 0.75" wide and drop off the shoulder at about 10". The inside has one zipper pocket and two slip pockets to store small items. The top of the bag has a zipper closure to keep all of your items inside safely stowed away. Each one is perfect for a fun day out! To care for your beach tote, simply use a lint roller regularly to keep any fuzz off. If it gets dirt on it, simply take a damp cloth with mild soap and gently rub off any dirt. In our design center you will find the world of personalization. You can do just about anything! Find the perfect font, pattern, ribbon, frame, or graphic to make your design just the way you want it. If you need a little help along the way, just give us a call. We are right here by your side! Looking for a different kind of tote? No worries! 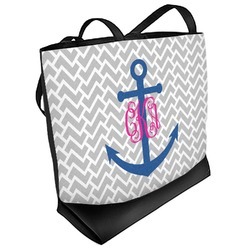 We have a great section of Tote Bags where you'll find many different styles. We have everything from grocery totes to everyday purse totes. But maybe you're just looking for a great day at the beach! Try our beach spikers, round beach towels, and sheer sarongs! You can't go wrong with a relaxing day on the water.